Most LED driver circuits use a series resistor to control the current through the LED. For applications needing a few LEDs, this is optimal. However, for applications needing many LEDs, this becomes extravagantly inefficient and it is tempting to keep the voltage drop across the resistor as small as possible. That leads to poor control of the current. 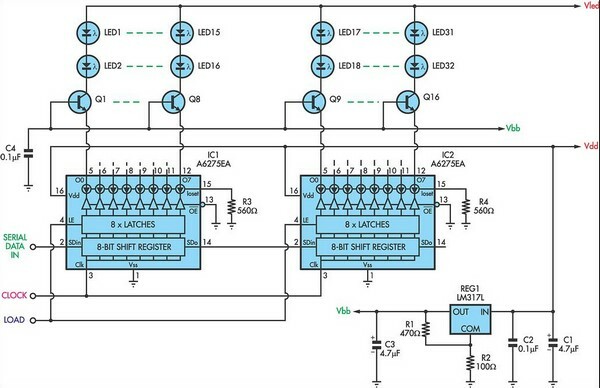 ICs such as the MM5450 and its relatives and the A6275 and its relatives provide constant current outputs so that the current through the LEDs is well controlled even though the voltage drop across the circuit doing the control is acceptably small. However, the difficulty with these circuits is that because they contain many constant current drivers crowded into a relatively small package, unless the supply voltage is small, they become too hot and can destroy themselves. This problem is not easy to solve. The solution is to maintain a small voltage across each constant current source. In this circuit, this is accomplished by REG1, the LM317L, which provides a bias of about 1.5V ±5%. Each transistor works as an emitter-follower, presenting the A6275 inputs with about 0.9V. Vled, the LED supply voltage, needs to be high enough to ensure that there will be at least 0.5V across each transistor but it is safe to allow significantly more than this and the supply need not be well regulated. The transistors can be general purpose NPN types such as BC548 and a single LM317L will easily supply a total LED current of at least 1A. A6275s are made by Allegro.